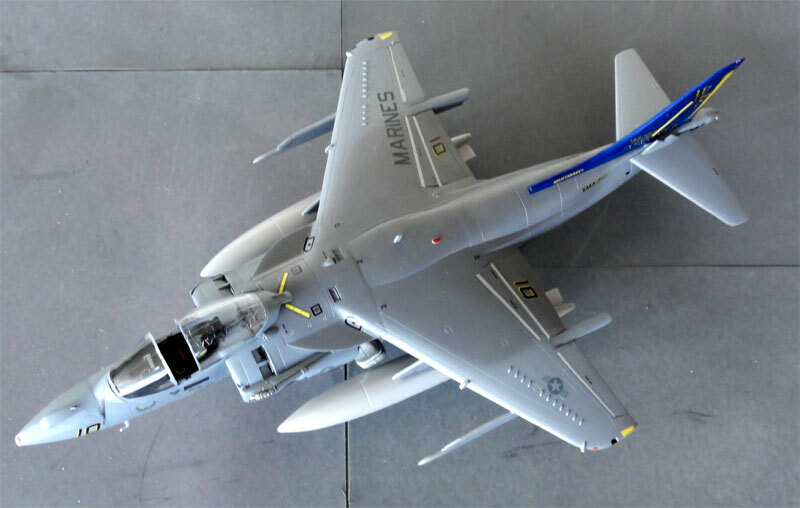 The McDonnell Douglas AV-8B Harrier II was based on the ideas of the Hawker Siddeley Harrier VTOL aircraft. 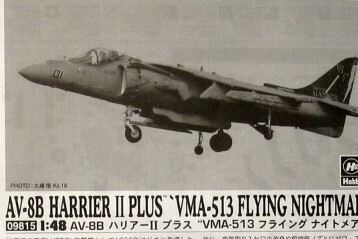 The AV-8B was developed with Hawker (later BAe) for the US forces intended for light attack or multi-role missions, and for the US MARINES CORPS the aircraft is typically operated from aircraft carriers, large amphibious assault ships. 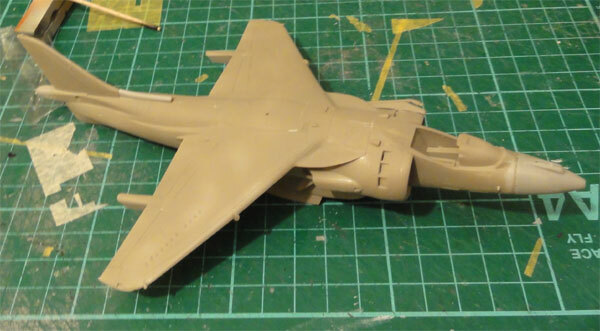 The aircraft was significantly changed with a new large supercritical wing, different front nose with enlarged pilot vision and many new systems and weaponry. 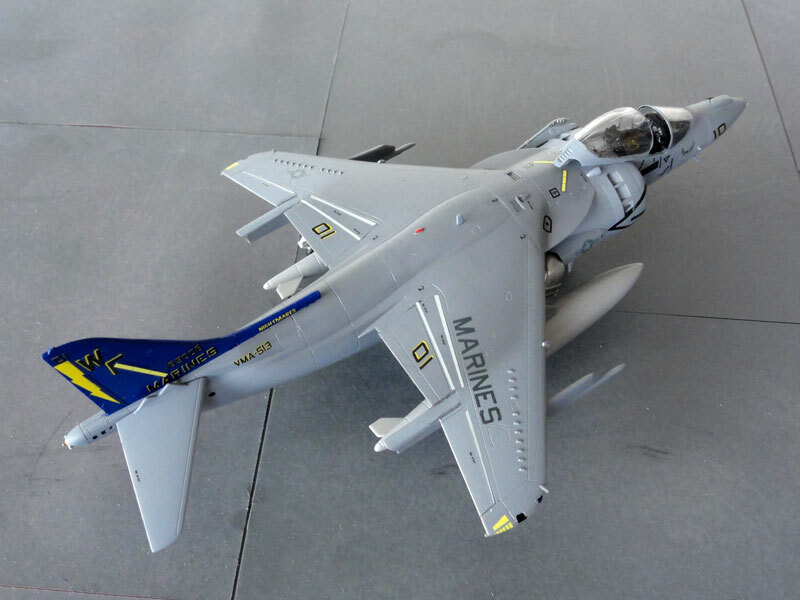 The AV-8B is used by the United States Marine Corps (USMC), Spanish Navy and Italian Navy. 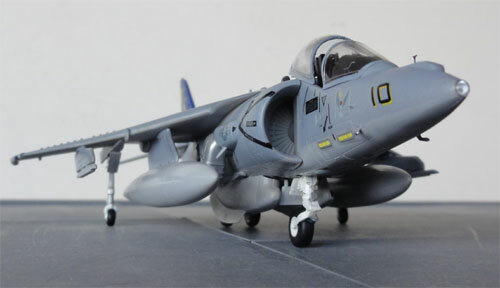 For the Royal Air Force, the British Aerospace Harrier II was developed and many versions exist. Most variations are in the systems, externally visible on different nose and antennas. 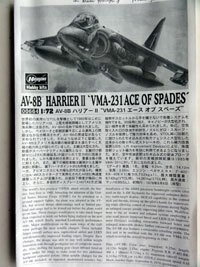 Hasegawa has issued this kit (no. 00664) in 2003. 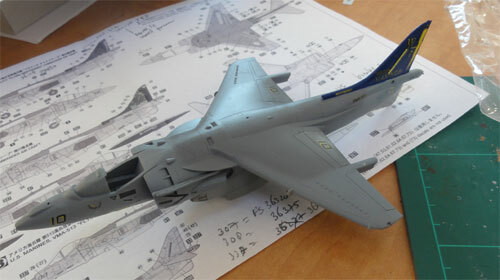 It is a very good kit with about 80 nice parts, in light grey plastic. The swivelling exhausts have a polycap. 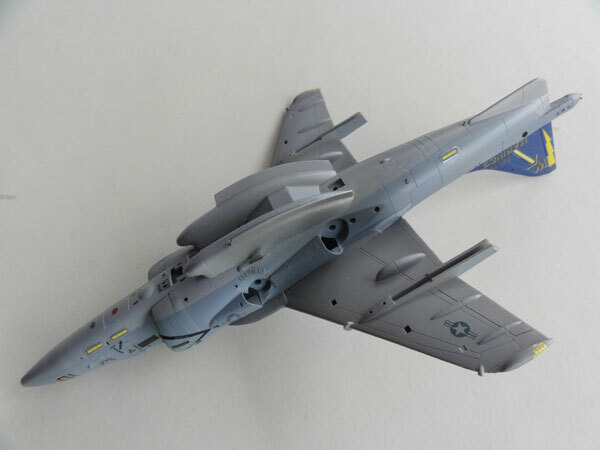 The upper intake doors are drooped open, as a real aircraft on the ground. 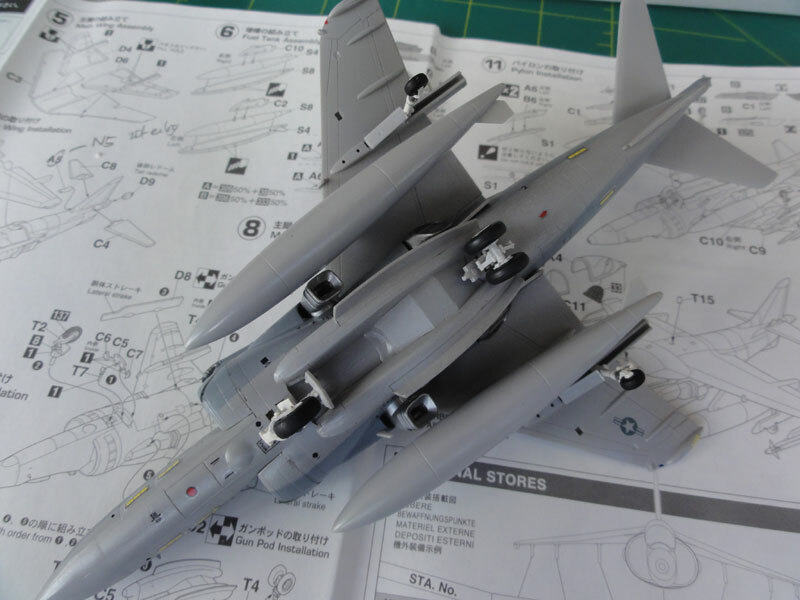 Stores of a few tanks, the lower gunpods and Sidewinders re in the kit. No bombs are provided. When the lower gunpod and ammopod are not fitted, 2 strakes are in the kit. A refuelling probe is also there. The kit looks accurate. 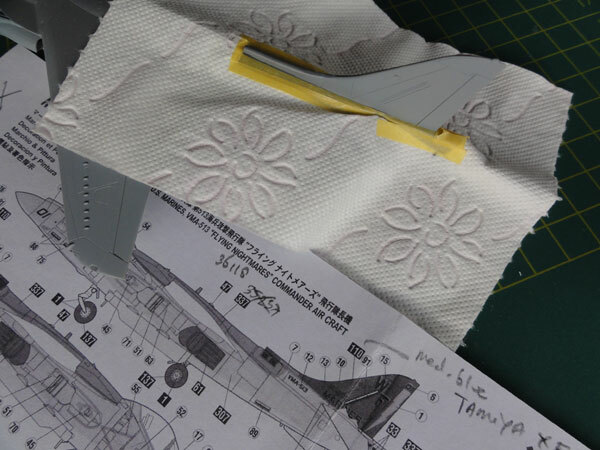 Panellines are engraved. 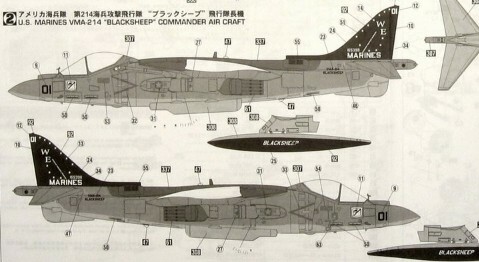 with camouflage schemes of probably FS36375, 36320 and 36237. 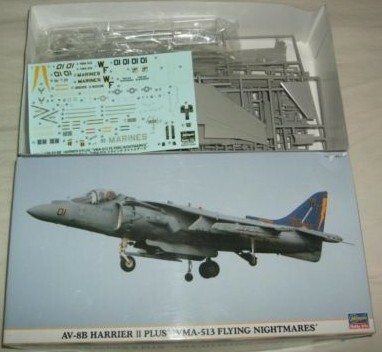 There is also a combo set: AV8B Harrier II plus (VMA513 & VMA214 Combo, including two kits). 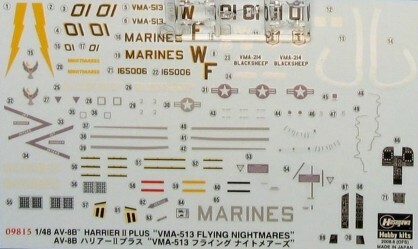 Decals for VMA-513 "Flying Nightmares" squadron were provided , flown by the US MARINES CORPS, as well as VMA-214 Black sheep and with two lower toned schemes for both. 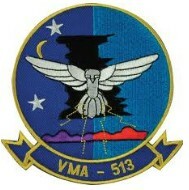 I liked the scheme of USMC VMA-513 Flying Nigthmares with code "WF" on a blue tail. 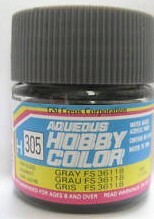 Probably the camouflage scheme is FS36118 and FS36320 upper surfaces and FS36375 lower surfaces. 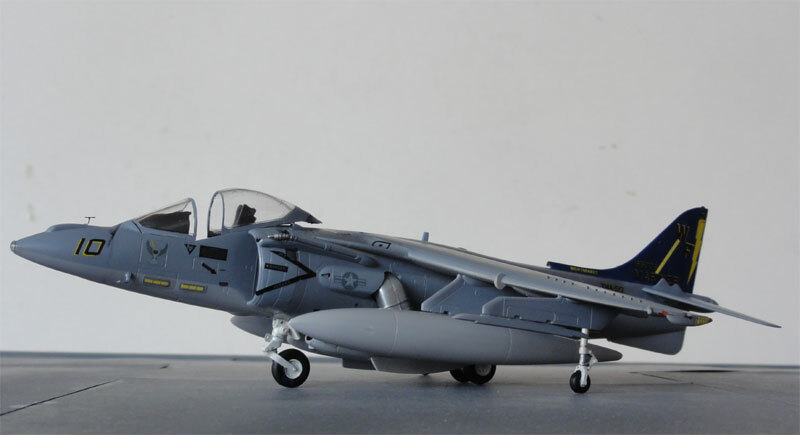 US ordance bombs can be painted FS14087 and UK bombs BS638. The kit was made almost straight out of the box. The cockpit is small and the seat was detailed with some belts and straps. Some filler was needed with sanding on the nose. 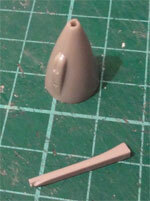 On the fairing between the lower fuselage gunpod and ammopod, some white glue was needed to close any gaps here. 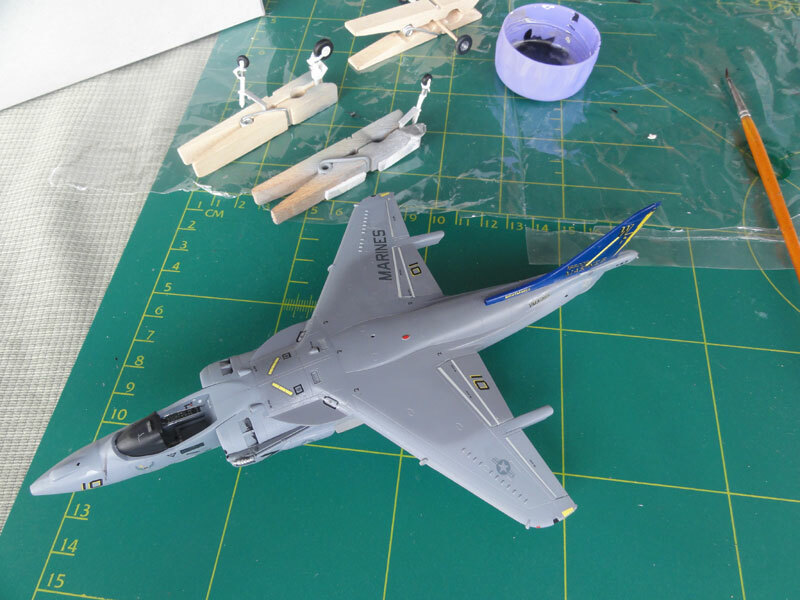 The airbrush was used with acrylic colours from Gunze Sangyo for FS36118 (H305) and FS36320 (H307) upper surfaces and FS36375 (H308) lower surfaces. 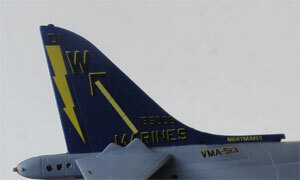 Also that required masking the blue tail area... for which I used Tamiya XF8 acrylic. 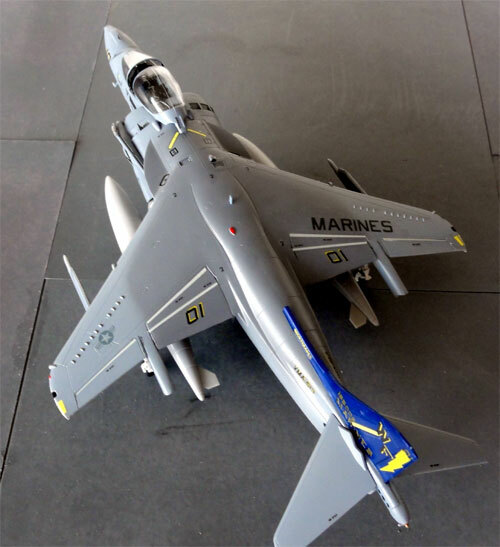 Before decalling, a gloss undercoat was airbrushed with Johnson Future/Pledge acrylic floorvarnish, this will mimimize any air bubbles under the decals (" silvering" ). For a change, large fuel ferry tanks were added. 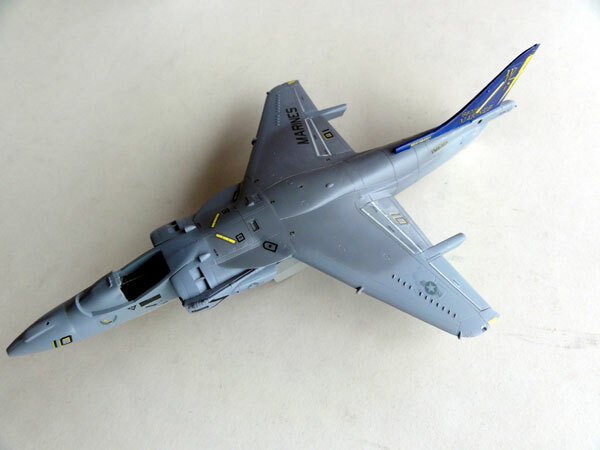 Almost no weathering was applied as this plane was new. The final coat was a varnish of again Johnson Future/Pledge to protect the decals and get an even sheen. 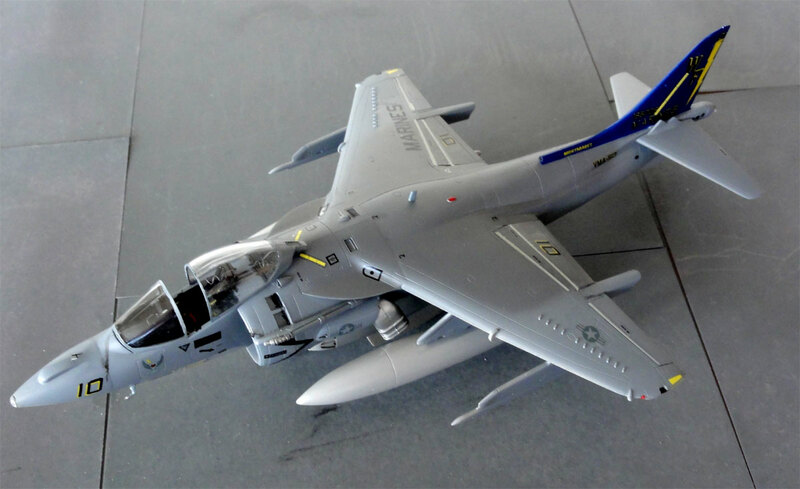 That completed this nice AV-8B Plus in the 1/72 model collection.